An entirely British concept and design, the rugged outdoor looks are complimented by a powerful, yet lightweight motor which is driven by a unique patented stackable Lithium Polymer battery system. This provides the bike with an unrivalled performance. The Extreme LPX looks and feels like a standard bicycle, making it a more discrete and practical vehicle whilst weighing less than most other electric bicycles. The Motor - The Epicycle Friction drive motor weighs only 1.82kg and is situated in the front wheel hub, making it easier to remove than the usual rear position, where gears may get in the way. The lightweight technology gives 200 watts of pure power, ensuring perfect balance for an effortless and enjoyable journey..
Motor Efficiency - The motor itself is small and discrete, and provides an unbeaten silent 80% efficiency. Instead of conventional toothed gears, the Infineum motor uses a series of satelite discs to ensure a smooth, yet powerful, ride. Cycle Computer - The Extreme's cycle computer shows the travelling speed and distance covered as well as showing the remaining battery level. It also allows the rider to select how much power is given by the motor. 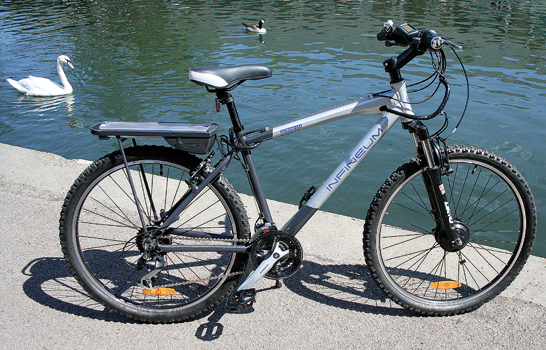 Mode 2 - Motor Power Only. The Infineum has an independent throttle on the handlebar to regulate power independently of pedalling. Mode 3 - Cycling Only. Motor power switched off. Modular Connectors - Modular connections allow the components to be attached to a central wiring loom, which is housed and hidden inside the frame. This offers an aerodynamic, streamlined, aesthetically pleasing design a well as protection from the elements. Consequently, servicing is made as easy as possible giving the rider the ability to simply unplug the components at source. Components - High quality branded components such as Shimano Alivio gears and Rock Shox shock absorbers enhance the performance and ride experience of the Infineum Extreme. 24 gears operated by Rapidfire trigger gear shifters and quality V-brakes make the Extreme ideal for both recreational and conventional cycling. Shock Absorbers - The Rock Shox Dart 1 aluminum and steel forks with coil springs compliment the Shimano range to give a lightweight, comfortable journey. Warranty - The Infineum Extreme Electric Bike comes with a 2 year Warranty, which covers the frame, batteries and electrics.